When I saw the title as "Never fail cake " in Cooking Is Easy blog,I cudn't resist myself from doing.The pictures were so impressing too.This is a full proof recipe and can never fail at any point,if u follow the recipe fully.This is originally a Betty Crocker recipe.Today I didnt plan to do.Rohith was getting bored and was asking for cake.So this recipe struck me and prepared along with Rohith.He was very helpful as u see in the collage.He likes to beat the cake all by himself.I was literally pulling the beater from him .The outcome was so perfect and all of us enjoyed it thoroughly.The cake was too fluffy and moist. It was just like the store bought one.See this link for converting weight into grams . * Pre- heat the oven for 350 degrees Farenhiet. * Sift all purpose flour with salt and baking powder.Mix them well and keep it aside. * Bring butter to room temperature. * Take a mixing bowl,add butter and sugar.Beat them well.My son was very helpfull in beating the mix. * Add eggs and vanilla extract.Let us beat them at high speed untill,it becomes fluffy.The more we beat,the more fluffiness we can get in the cake. * Add the milk and beat the mix once or twise,just to make sure the milk is blended well into the mix. * Now bring ur beater to slow speed and add the flour mix.Slowly fold the mix and let it get mixed well without any lumps.Dont beat it.Just fold in.Because,if u beat it hard after adding the flour,then your cake wil not rise. * The quantity ,I have mentioned here makes a really big cake.So take two round pans or a single large rectangle pan ,grease them first with butter.Then flour them .This helps the cake to rise a bit. * Pour the batter in each cake pan and bake it for 35 to 40 mins or untill the fork comes out clean.Bake the cakes in batches. * Transfer it to the wire rack and cool completely. * Cut the cake into cubes and store it in a air tight container. (Sorry for the rough cuts on the cake.Rohith was doing all the mess while he was cutting it). * The cake will rise upto 1/4 the size.So use a larger pan. * Pre heat the oven for atleast 20 mins. * While pouring the batter into the pan,fill it 3/4 the the space as the cake will rise a lot. *Each oven has different settings,so bake the cake ,untill toothpick comes out clean. * To convert cups to grams ,take 1 cup of all purpose flour ,that roughly equivalent to 140 gm. As the name tells it,has come out super moist !So,Rohith had a great time.Isn't it ? The texture of the cake is too good. Thanks for sharing this foolproof recipe. 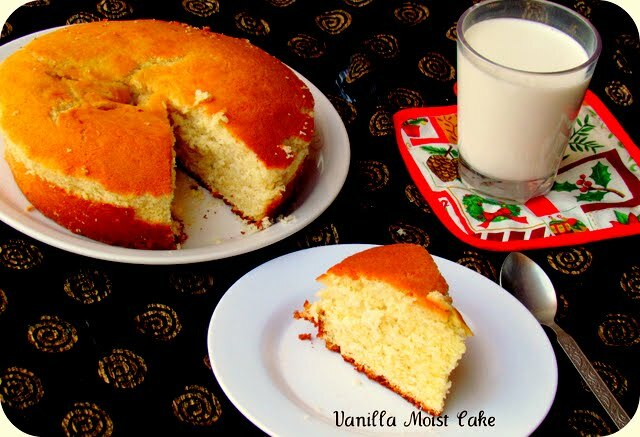 Super moist and yummy cake, perfect with a cup of tea. Swathi, thanks for trying out my never fail cake...and it has come out perfect...I would appreciate it if you would hyperlink to my blog and my blog's name is Cooking Is Easy. Thanks, Nisa Homey. The cake has turned out so spongy and love the colour and texture...looks super delicious. Perfectly baked caked! Looks spongy. Love the super spongy texture of the cake, looks marvellous..
Beautiful, simple and delicious looking cake.. I would love a warm piece right about now. This is lovely ... looks so soft & moist. Delicious and perfectly baked! Wow super soft,looks awesome dear. Love the super spongy texture of the cake, looks marvelous..
Cake looks super spongy and yummy. The simplest are usually the best :) very moist and crumbly = Total yum! Wow,simply awesome recipe.Wonderful presentation of fluffy cake. cake look spongy and loved the texture !! Awesome soft cake nice with tea. Cake look super spongy and yummy.Kudos to the little helper. wow..sure its a never fail cake..cake looks great,very soft..feel like having a bite now..yummy !! perfectly baked savitha- i am bookmarking this! name correctly suits to it looks so sofy n yummy.bookmarked it dear..
your cake look so fluffy, love its small crumb. if only I had a slice.. 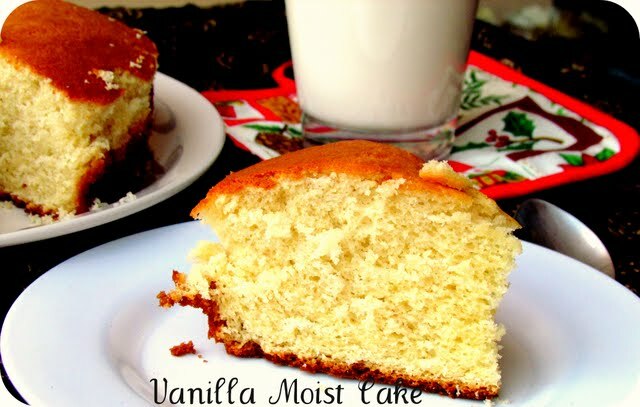 Vanilla is always my love and this recipe is perfect! Thanks for sharing! I am your latest follower and would like to invite you to follow my blog too! Looks delicious and super moist.. The texture is amazing. I bake gluten free so I never see anything like this. I find my cakes are tighter. This is a recipe that is easy to handle and it looks yummy. Thank u gals.For ur support. @ Reshma, I am so honoured dear.Thank u for trying out my recipes.I have used standard American measuring cup,which is 240 gm / cup.R u convinced,if not shoot ur questions,will be happy to help u . When do you add the milk? I thought it went with the butter and sugar mix, but it ended up like soup batter. Please tell me where the milk is supposed to come in. thanks for trying out thi recipe.Sorry for not mentioning the addition of milk.After we beat the butter and sugar,then add milk.dont beat it too much,after adding milk.Then lastly add the flour. You mention milk in the ingredients however i didn't see that milk is added in the directions. I've seen this in other recipes on your site. Is milk used? Thank u Sherry for taking ur time to tell me this.Yes we have to add milk ,before we add the flour.I have updated the post.Plz let me know,where I have not mentioned in other posts.I take care to edit every post perfectly,but at times could not be 100%.Sorry for the trouble. It burnt on top and is soggy inside. Shame really as I followed instructions perfectly! It would be better,if u would have given your name.Have you baked in a good baking pan ? Is your oven preheated to 350 degrees farenhiet? Have you cooked the cake till the tooth pick comes out clean ? Because,this is more important than baking for 35 - 40 minutes. As the settings of one oven differs from other.And at last,have you greased the pan?Because,there are less chance for this cake to fail.I have tried many times ,so also my friends. Could you please tell me if this can be frozen? Thank you..it looks delicious and i cannot wait to try it! Thanks for this post. 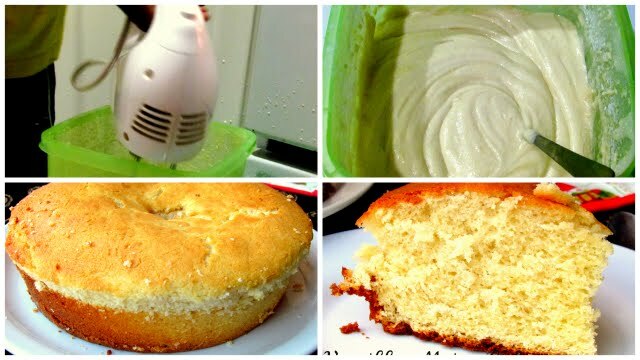 I have been searching and trying out several super soft and moistvanilla cake recipes with no success. This was a total Winner!! !Thumbs up! Thanks for this post. I tried this recipe and it turned out hard. I think it is a problem with my measurement. Can u pls give an equivalent in grams? Thank you. My cakes almost always ended up with burnt tops until I read on 'Joy of baking' that you're only supposed to heat ur oven from the bottom for baking. That is do not switch on the upper heating element of ur oven just use the lower one. My cakes have never burnt ever since, the tops are perfect and levelled too they don't even crack any more. Thank you soooo much for this amazing recipe. I've never had fluffier cakes ever. Turned out just right. I have never freeze this cake.But will reply to u ,when I do it.Thanks. Thanks for trying this recpe .Sure I do have a choc cake.Will post it soon. Well, I tried the cake. And it turned out...very oddly. It looked like corn bread when it came out. When I gave a piece to my Dad, he asked, "How much salt did you put in?" I'd double checked several times on the salt. It was the right amount. And yet...it came out salty. And finally, it tasted like corn bread. Really weird. For once, I'm pretty sure I didn't mess the recipe up. And yet...I have salty corn bread. I would advice you not to mess up with the ingredients. We cannot judge the outcome then. Really wanna try out ths cake..just to b perfect n rite on the ingredients...xactly hw much butter (one stick)is used? n olso, wil the baking tym b 30mins even if i try with haf of the above qtys? I have updated the post with the amount of butter.If it is half the quantity,then chk the cake between 20 - 25 minutes roughly. If the tooth pick comes out clean, then our cake is done. Thnk u sooo much! :-) me gona bake rite away...cnt wait!